MOUNT DESERT ROCK, Maine — Even on days when the sun beams down from directly overhead, it is possible for visitors here to lose track momentarily of which way the nearest land mass lies. If not for the few buildings on this barren rocky outcropping, there would be only two main things to dominate the view: the ocean and the sky. Even in good weather, the peaks of Mount Desert Island, more than 20 miles to the north, usually are small hazy bumps on the horizon. If fog sets in, as it did one day last month when a relative crowd of about two dozen visitors spent several hours on the 3-acre island, the sense of solitude at the most remote light station on the Eastern Seaboard is even more profound. In a thick fog, the only indication that gray seals have gathered down by the granite shoreline is the sound of their groans rolling through the mist. But to a trained eye there is a lot more to see from Mount Desert Rock on clear days than air and water, which is why College of the Atlantic has brought researchers and students out here each summer since 1973. Besides gray seals, harbor seals, whales and seabirds all congregate on or near “the rock,” as local mariners refer to it, because of the kind of environment that makes it hard for humans to reach. Whales feed in the surrounding water, which is hundreds of feet deep, and seals and birds come to the island, which rises only about 20 feet above sea level, to avoid predators and to raise their young. Students and researchers in turn come out for several weeks in the summer to study seals and birds on and around the island and to document the presence of nearby whales from the top of the island’s granite lighthouse, which rises approximately 70 feet above the surrounding ocean. 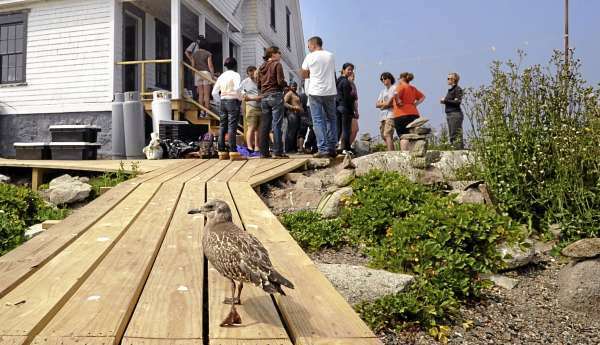 According to Sean Todd, marine science professor at COA and director of the college’s Allied Whale research program, the chance to study seabirds and marine mammals in such a setting is a rarity, especially for undergraduate students. The environment of Mount Desert Rock sometimes attracts more than fog and visitors, however. Because it is so remote and exposed, it also gets severe weather, which if it materializes in the summer, results in researchers and students being called back to the mainland. This was the case a year ago on Aug. 23, when Hurricane Bill passed by the Gulf of Maine in the Atlantic Ocean. The island had been evacuated because of the approaching storm, but the empty wooden buildings soon bore the brunt of extreme weather conditions that hadn’t been seen in the gulf since Hurricane Daisy roared past in 1962. The storm surge and large waves churned up by Bill, combined with an extreme high tide, buried Mount Desert Rock under a seething froth of violent surf. Waves pounded into the generator building, taking out two walls. The roiling water smashed through the former lightkeeper’s house, ripping off porches, turning furniture inside into battering rams and flooding the first floor nearly up to the ceiling. Concrete walkways that had connected the buildings were ripped up and tossed aside like cardboard. The nearby boathouse was ripped apart by the waves, leaving only one wall standing when the storm subsided. The other pieces and contents of the boathouse, including a steel I-beam and a large contractor’s air compressor that had been inside, still have not been found. The damage prompted COA officials to cancel the remainder of seasonal programs on the island for 2009. How and when the facilities could be repaired, and when their research and education programs might resume, they did not know. But earlier this summer, having decided the island’s educational and research programs should continue, COA officials sent out carpenters and college staff members to begin the process of making badly needed repairs. With initial costs estimated at between $50,000 and $80,000, college officials wanted at least to refurnish and repair the main house so students and researchers would have comfortable shelter during their stay. 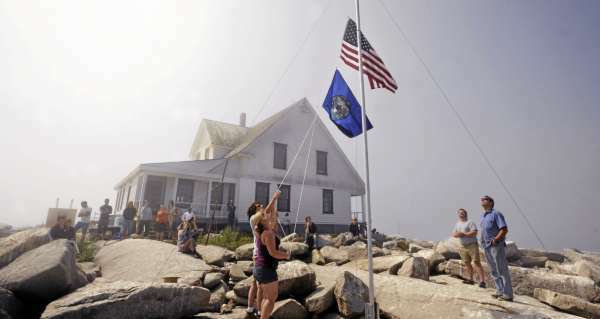 Last month, nearly one year after Bill devastated the island, COA staff and students held a brief flag-raising ceremony on Mount Desert Rock to mark their progress and the resilience of their commitment to the remote field station. Both a U.S. flag and a blue flag of planet Earth were raised on an aluminum pole they had finished erecting just before the ceremony. Dan DenDanto, a 1991 COA graduate and Allied Whale research associate who has been spearheading much of the repairs, said the programs at Mount Desert Rock are important to the COA curriculum and to the efforts by Allied Whale to research and help protect endangered whales. Despite the repairs to the main house and the new wooden walkways between buildings, lingering damage from the hurricane is still obvious. Wooden piers and braces shore up the second-story classroom of the generator building where the storm ripped away exterior walls beneath it. With the loss of the generator, station visitors now rely on oil lamps for illumination at night. And the remaining wall of the boathouse still stands alone at the top of the slipway used to convey small boats and supplies from the water onto the island. Hurricane Bill was not the first storm to hit Mount Desert Rock, but it was the first to cause major damage on the island since COA took over ownership of the facilities from the Coast Guard in 1998. Now the only official government commitments to the island are the Coast Guard’s maintenance of the automated light signal and a fog horn, and the National Oceanic and Atmospheric Administration equipment on the tower that records wind speed and direction and air temperature. Everything else is COA’s responsibility. There has been a consistent human presence on Mount Desert Rock since the first half the 19th century, when the first lighthouse was established on the island. The current light tower, built in 1847, has a granite shell several feet thick that, as it did with Bill, has withstood many violent ocean lashings. In previous decades, lighthouse keepers and Coast Guard members sought shelter from other powerful storms inside the tower’s stout walls. Last week, COA officials decided to evacuate the island again as Hurricane Earl approached from the North Carolina coast and bore down on Nova Scotia. The buildings were boarded up and researchers, staff and students were brought back to the mainland, though the storm’s surge was not expected to be as high as that of Bill. In an e-mail sent Wednesday, Todd indicated that COA had not yet been able to get people back out to Mount Desert Rock to assess possible damage from Earl. He added, however, that because the storm weakened considerably before it reached the Gulf of Maine, COA officials hope it did not cause as much damage as they had feared it might. 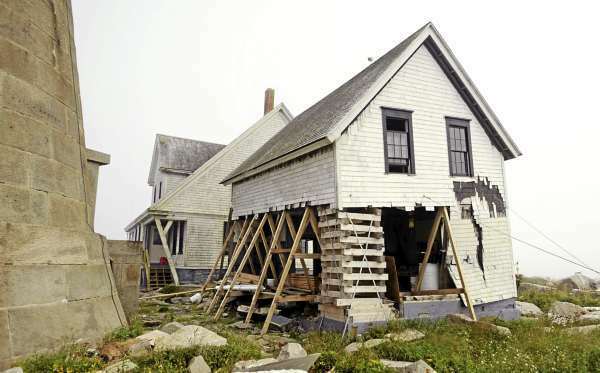 Though the lightkeeper’s house has been repaired and now has new furniture and propane-powered appliances, it still is not being used exactly as COA officials would like. The house, which used to be split down the middle so it could house two separate families, can accommodate about 20 people. It usually has half a dozen or so people in residence at any one time, but without the use of the other buildings the demand for space in the house remains high. Two downstairs rooms that could serve more administrative functions are now being used as a workshop and a classroom. The generator building’s first and second floors had been used for these purposes, but with two of its walls still missing it is unsafe to use. Technological advancements are important to the research station’s future, according to Todd. Electrical power generated from wind and solar energy is one of the most pressing needs, he said. The Coast Guard already has solar panels on the island to power the foghorn and light. More panels and a wind turbine would provide island visitors with a reliable, adequate power supply, he said. Water also is an issue. 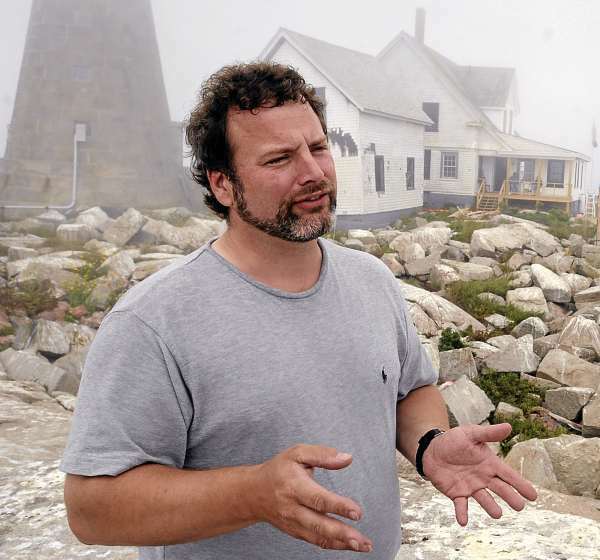 Island visitors can collect rain off the building’s roof for some uses, Todd said, but all the drinking water on the island has to be brought from the mainland. There used to be a small spring on the island, but when some Coast Guard crewmembers tried to increase the spring’s output with a blast of dynamite, they ended up blocking it off instead, he said. Drilling a well would solve that problem, and another: If the well were deep enough, a cable attached to the light tower could be submerged far enough down in it to drain away any burst of electricity from a lightning strike. Because the tower is the tallest object for miles around, lightning strikes pose a threat for catching the adjacent buildings on fire, Todd said. But drilling a well itself is a problem on a remote rocky island with no dock or boat ramp. How they might get a drilling rig to the rock is something they have yet to figure out, he said, as is where the college might get the money to fund all these projects. If the college can finish restoring the buildings and make the improvements it would like, Todd said, it could have room for more people and may lengthen the island’s summer programs to earlier in the summer and beyond Labor Day. More time would allow researchers to collect more visual data they could match up with audio recordings they make of underwater marine life using three submersible buoys positioned near Mount Desert Rock, he said. By matching the audio with the visually observed behavior of whales or seals, they can glean more from the audio that is recorded when no one is on the island watching for marine mammals. If they can extend the research season further into the fall, Todd said, scientists also could have more time to observe birds during their annual fall migration. According to Brandon Schult, a 2009 COA graduate who has been managing the station’s logistics this summer, a lot can be accomplished on Mount Desert Rock, not just in terms of marine research and education, but also in terms of learning about sustainable living, which the college is known for. To accomplish these goals, he said, COA will probably need broad support from beyond the campus limits. Jessica McCordic, a third-year COA student from Lexington Park, Md., was one of only a handful of people staying on the island for several days last week. She said she didn’t know much about COA’s programs on Mount Desert Rock until she started classes at the college two years ago. Now, she has been out to the rock a few times, she said, and thinks other people should get the same opportunity.